I participated in a campaign on behalf of Mom Central Consulting for Welch’s. I received product samples to facilitate my review, and a promotional item as a thank you for participating. It’s always interesting to me what memories you carry with you in life. Some of them are big, like your first trip to Disney World. And some of them are more mundane, like your favorite snack. We recently were visiting my family in Maine, and we created a number of new memories. Bubbles reminds us frequently of some of her favorite moments from the trip: visiting the pumpkin patch, playing with her young cousins, and the little gift that my Mom would leave on the table for Bubbles to open each morning when she woke up. My personal favorite memory from the trip, though, was seeing Bubbles and my Grandmother interact. The last time we had the opportunity to visit everyone in Maine, Bubbles was only 8 months old. While my Grandmother has three great-grandsons, Bubbles is the first great-granddaughter and I know she hoped for a little bonding time. At that time, though, she was still a little shy and wasn’t overly interested in being held by too many other faces. This trip, though, Bubbles was a burst of personality. She sat with my Gram and read her books, talked to her, showed her games, and even tried to get her to race trucks. 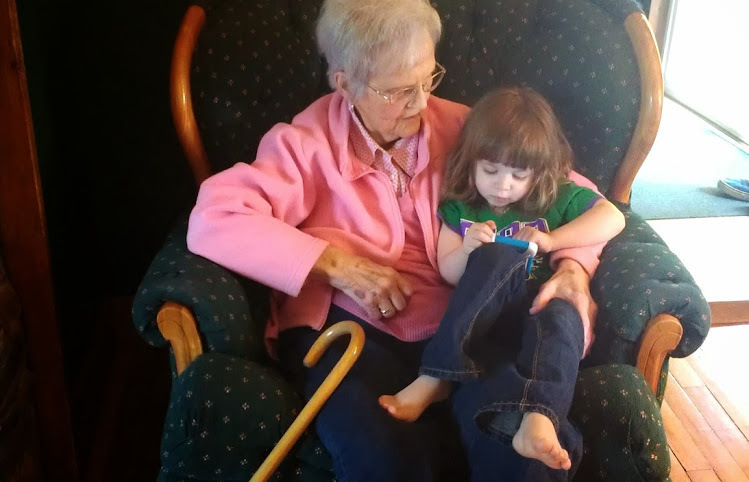 I know that my Grandmother really appreciated getting to see the side of her that we see every day, and I loved having all four generations together for a few days. Welch’s believes in celebrating these special moments, too. That’s why they’ve launched a new movement called “Share What’s Good”, which is about sharing those moments that occur with friends and family, whether at home or on the go. On the new Share What’s Good website, they’ve put together a collection of fun family ideas and recipes. There’s also a place for you to share photos of your everyday moments. 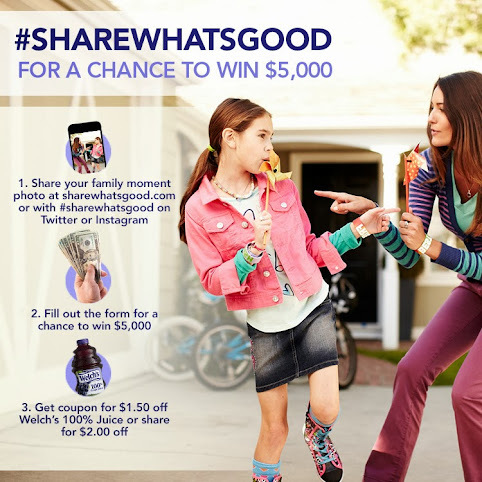 As part of this campaign you can also participate in the Share What’s Good Photo Contest. Until October 25th you can upload a photo of your favorite family moment for a chance to win $5,000! If you won, maybe you could take a family trip to make some more family memories. Be sure to follow along on Welch’s Twitter and Instagram accounts, too. Welch’s has helped create memories in our lives, too. Growing up I remember a bottle of Welch 100% Grape Juice always being in our fridge. It was my father’s favorite drink. 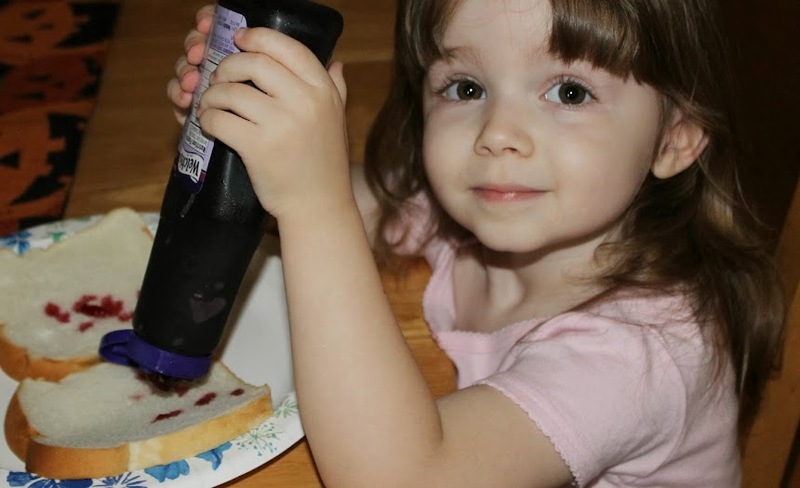 And Bubbles has become quite a fan of Welch’s Grape Jelly for “peanut butter jelly time”, as she calls it, especially when she gets to help make the sandwich herself. What are some of your favorite family moments?